The model making process drives our site analysis on our many projects. In our studio, we combine drone photography, geospatial mapping, field collected data, and topographic surveys to quickly create scaled plans of existing conditions. This process is greatly influenced by the work of the late Scottish designer Ian McHarg, who wrote the highly influential book “Design With Nature”. McHarg and his team of assistants famously would work on large mylar sheets to create scaled maps of soils, habitats, topographic relief, and other environmental features. These semi-transparent sheets would then be layered to create a combined map of a landscape. Our team provided an analysis of the impact of new shadow created by a proposed development in Westport, CT. The proposed project site is on the western side of the Saugatuck River. The site is covered primarily by deciduous trees which lose their leaves during the cold season, allowing sunlight to penetrate to the forest floor until Spring leaf-out. There is also a large intertidal wetland at the toe of the sloped site. Thanks to a grant from the DEC, we are working with the Environmental Cooperative at Vassar Barns, Susan Blickstein AICP/PP, PhD, and the LRC Group to develop a campus-wide green infrastructure strategy. 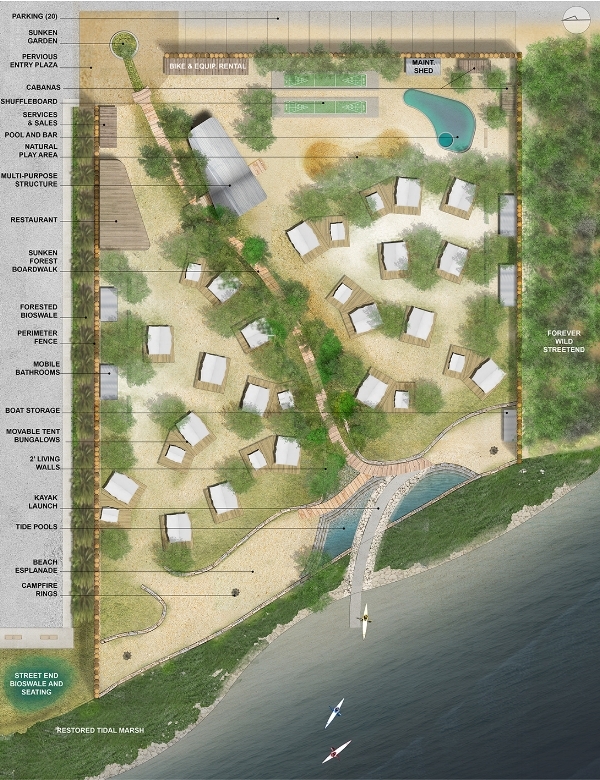 We started working with Camp Rockaway several years ago to develop a landscape vision for a private ecotopic campground within the City of New York. Just last week they opened up their first beach tents at Fort Tilden!